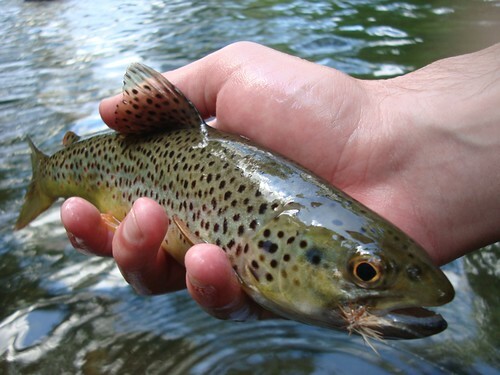 Throughout the spring and summer many trout anglers travel to fly fish the Gunpowder. 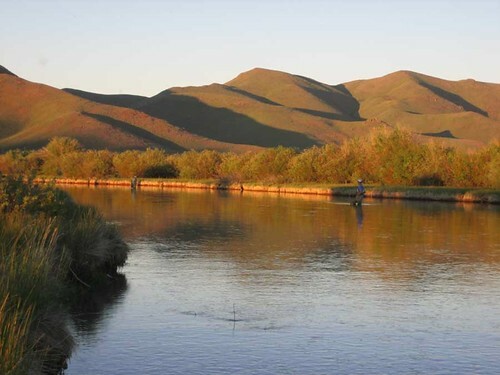 Few take advantage of the reservoirs, above and below the river, which provide great warmwater fishing with a flyrod. Both large and smallmouth bass, other panfish, pickerel, and carp can all be caught on the fly. 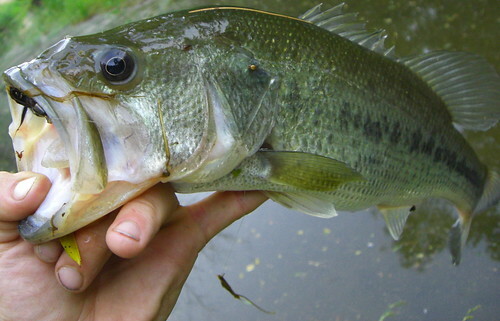 Many bluegills are in the shallows to spawn and large bass and pickerel are cruising shorelines in search of food. Big bass on streamers and palm-size bluegills on poppers is a great way to spend a few hours before an afternoon of trout fishing. Large carp pushing ten pounds swim in pods in shallows where surface wakes and clouds of mud are easy to see. 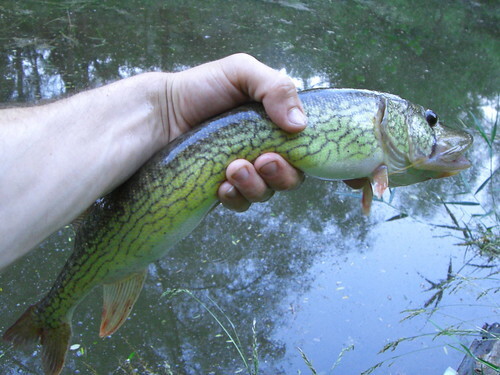 Lots of Pickerel and largemouths can be caught in Loch Raven, while Prettyboy supports good numbers of smallmouth bass and red eyed rockbass. Mornings and evenings the fish are more aggressive, although sight fishing along shorelines can be easy with the bright sun at midday. This entry was posted in fishing report, news on June 29, 2008 by Jason du Pont. 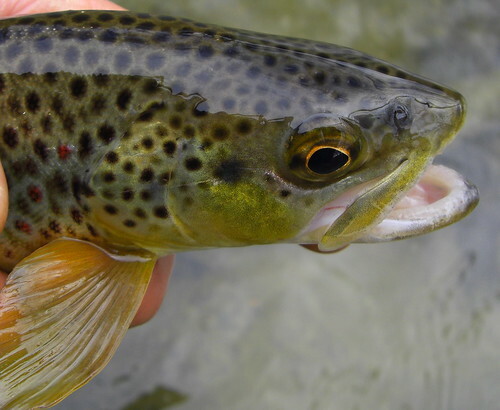 On a recent outing to the catch-and-release area of the Gunpowder river, I was happy to have landed a good number of fish including a nice 16 inch brown. If fished from about 6 o’clock to 8, and landed a good number of fish casting small elk-hair caddis and large stimulators into riffles. There were no fish consistently rising, but they were eager to take properly presented and skated caddis imitations. At one point, the mist was so thick that I resorted to a dead-drifted size 10 wooly bugger with a small green Copper John dropper. I took the 16 incher on a fingerling rainbow imitation streamer. The evening was a good time to fish because it was nice and cool, and the sun wasn’t as strong as during the middle of the day. All in all, a good day in the catch-and-release section of the Gunpowder River. This entry was posted in fishing report on June 29, 2008 by Max Meneveau. Please join us for a flyfishing school. On Sunday, July 27, a Backwater Angler Guide will be teaching a fly fishing school that is ideal for beginners. If you’re planning on flyfishing Maryland, or anywhere else for that matter, this course is a great introduction to the sport. The school covers knots, casting, gear and fly selection. Schools are held in a meadow overlooking the Gunpowder river by a Maryland state licensed and insured fishing guide. Class is held from 11:00 AM till 2:00 PM. Cost is $100 per person and includes the use of gear. Class size is limited to 4 and pre-registration is required. Please give us a call at 410-329-6821 or drop us a line at info@backwaterangler.com to pre-register. This entry was posted in events on June 23, 2008 by Theaux Le Gardeur. While I was fishing to a good Hendrickson emergence a few months ago, an angler passing me on the trail told me he saw spawning fish in some shallow riffles. 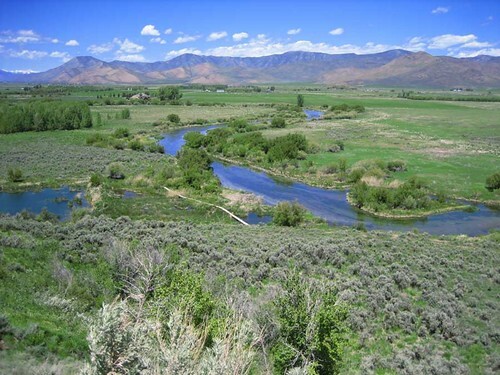 I continued fishing a snow shoe emerger with success until I thought I’d take a look at the area he mentioned. Suckers, some nearly twenty inches long, had gathered in a section of riffle water to spawn. Prior to this I spotted groups of smaller suckers spawning in Little Falls, as well as in the Lower Gunpowder. The clear, shallow water of the upper river at that time made for some prime viewing and videotaping. These fish had either migrated or congregated in riffles above Falls Rd, which means the sucker fry should now, months later, be providing the brown trout with a bit larger meal than normal. We also have a run of Gizzard Shad on the Gunpowder, which swim up from Loch Raven Reservoir. These bluish-gray 10-16 inch shad with a distinct forked tail and dark spot behind the gills can be found in areas of the upper river. The past two years I have seen more and more of these fish spawning during late May into June. The migration has ended for them as hundreds of shad are schooled up in the Plunge Pool below Prettyboy Dam. This entry was posted in fishing report, video on June 23, 2008 by Jason du Pont. Please join us for a flyfishing school. 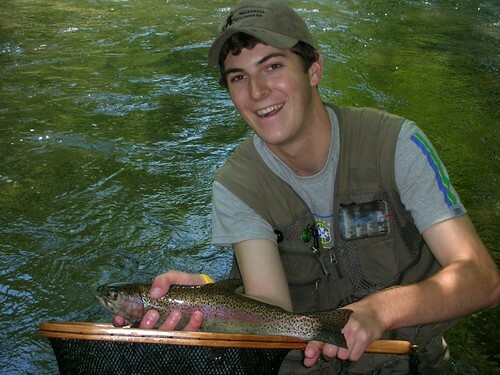 On Sunday, July 20, a Backwater Angler Guide will be teaching a fly fishing school that is ideal for beginners. If you’re planning on flyfishing Maryland, or anywhere else for that matter, this course is a great introduction to the sport. The school covers knots, casting, gear and fly selection. Schools are held in a meadow overlooking the Gunpowder river by a Maryland state licensed and insured fishing guide. Class is held from 11:00 AM till 2:00 PM. Cost is $100 per person and includes the use of gear. Class size is limited to 4 and pre-registration is required. Please give us a call at 410-329-6821 or drop us a line at info@backwaterangler.com to pre-register. Please join us for a flyfishing school. 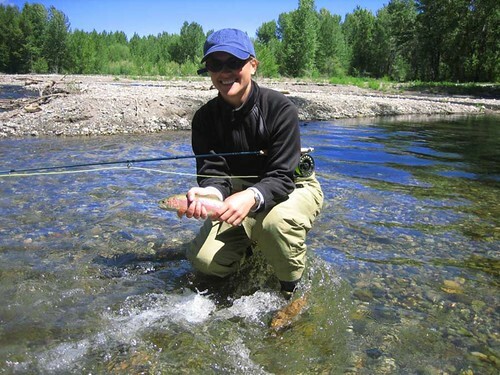 On Sunday, July 13, a Backwater Angler Guide will be teaching a fly fishing school that is ideal for beginners. If you’re planning on flyfishing Maryland, or anywhere else for that matter, this course is a great introduction to the sport. The school covers knots, casting, gear and fly selection. Schools are held in a meadow overlooking the Gunpowder river by a Maryland state licensed and insured fishing guide.Class is held from 11:00 AM till 2:00 PM. Cost is $100 per person and includes the use of gear. Class size is limited to 4 and pre-registration is required. Please give us a call at 410-329-6821 or drop us a line at info@backwaterangler.com to pre-register. The Gunpowder river is flowing at 75 Cfs and is a cool 54 F. The fly fishing along the Gunpowder has been much better most mornings, as the fish are keying in on small nymphs, (#18-20) in the upper river before 11:00 AM. Caddis and Sulphurs have also been producing by midday but the hatches have slowed down a bit. Spinner Falls have been spotty, but still worth a late look. Streamers have also been getting a lot of attention, especially in the stretch downstream of York Rd. A good report this morning from Jeff pointed to lots of takes on small caddis and craneflies. The slow water caddis has also been a very effective pattern just downstream of the Masemore stretch. Lime Sallies are coming off down towards Monkton Station. Fireflies are present through most of the meadow stretches, but a fur ant will do the trick, especially along the high banks. Sneak into the shop this weekend and celebrate Father’s Day with us and check out our latest shipment of rods from R.L. Winston, Scott, Sage, and St. Croix. This entry was posted in fishing report on June 13, 2008 by Theaux Le Gardeur. We still have room in our fly fishing school this Sunday. If you’re planning on flyfishing Maryland, or anywhere else for that matter, this course is a great introduction to the sport. The school covers knots, casting, gear and fly selection. Class is held from 11:00 AM till 2:00 PM. Cost is $100 per person and includes the use of gear. Class size is limited to 4 and pre-registration is required. Please give us a call at 410-329-6821 or drop us a line at info@backwaterangler.com to pre-register. This entry was posted in news on June 10, 2008 by Theaux Le Gardeur.